Do the various additives and mixtures really matter for our small engines? Find out in this article! ***This article is reprinted from the October 2009 NAMBA Propwash with permission from the author and NAMBA. The entire newsletter can be found at www.namba.com. 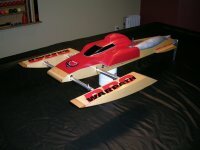 Gasoline is the most complicated and variable fuel used in model boating. The base is a mixture of molecules and there are various additives for a variety of purposes. Does it really matter for our small engines? We decided to find out. We purchased several varieties of automobile fuel and some fuels that were not advertized as “gasoline”. Since the most common additive in today’s gasoline is alcohol, we tested for alcohol using the fact that most alcohols dissolve more easily in water than gasoline. Mike (“science is my favorite subject”) Bontoft and I mixed equal amounts (500 cc) of water and the test fuel in a 1000 cc graduated cylinder. If there is no alcohol in the fuel, the dividing line between the water and gasoline will be at 500 cc. Since water is denser than gasoline, the water will be on the bottom. The dividing line moves up as the amount of alcohol transferred from the gasoline to the water increases. The first fuel was 87 octane gasoline with no additives. This will pass the standard Digitron test for additives used in APBA and other professional racing. It passed our alcohol test with the dividing line at 500 cc on our graduated cylinder. We purchased some Coleman camp fuel at Walmart that also contained no alcohol. Some Union 76 92 octane premium gasoline contained 8 percent alcohol. Fuel advertized as E10, supposedly containing 10 percent alcohol, actually was 32 percent alcohol. E85, purchased at the same station and advertized as containing “at least 70 percent ethanol”, was only 60 percent alcohol by our test. We used three different oils, all mixed at 16:1 or 8 ounces per gallon, in our testing. The tests were all run on the same M&D modified Zenoah with our standard, fixed length, M&D pipe. We used the factory standard ignition timing for all runs. This engine is representative of the best modified Zenoahs available. Our dyno is not calibrated and the powers reported are for comparison purposes only. Runs were corrected for pressure, temperature, and humidity. The engine was relatively new and broke in over the test period. This shows in a run at the beginning and toward the end of our test series with the 87 octane standard fuel. The graph marked “87 Otto” was at the end of the test runs. The high rpm power increased significantly with break in. All the comparisons shown in the graphs were from adjacent tests. We retested the 87 octane fuel several times as a reality check during the test session that spanned over 50 runs. Care must be taken when reading the graphs not to read too much into small differences. All graphs are averages of at least three runs. The data acquisition software smoothed the result from the individual runs as well. However, the standard deviation measured between the three runs ranged from 1 percent to 3 percent. Taking the variation on most runs to be around 2 percent means that variations in peak power of around +- .15 hp are not significant. The oil tests in particular show results that are as equal as you will get in any series of runs. The first test set was at the same carburetor needle setting for all fuels. This setting was optimum for power on 87 octane gasoline. The oil was Honda HP2. With the exception of E10, there was no real difference in the fuels. The alcohol containing fuels need a richer mixture than standard gasoline. Also, Walboro carbs are designed to meter gasoline, so the mixture variation over the rpm range probably is not the best for fuel with significant (remember the E10 was 32 percent) alcohol. Later tests where we changed both the high and low mixture settings brought the power of E10 back in line with the other fuels. The next series of runs were with different oils. We tested Honda HP2, a standard synthetic racing oil; Shell Advance, a synthetic oil with a high castor oil content; and some synthetic oil from John Otto. As expected, there was no real difference in power from any of these oils at the same 16:1 mixture. As was stated before, this is as close to the same as you can get in a series of runs. If anything, it shows that our dyno has more scatter as the rpm increases. The third series of tests compared the alcohol containing fuels with the standard 87 octane gasoline at the best needle setting for all fuels. Here it looks like the gasoline has an advantage at lower rpm while the alcohols are better at high rpm. However the differences are close to within the standard deviation of all the runs. I bet that there is really no difference. If anything, this shows that the mixture is better for the alcohols at high rpm and poorer at low rpm. Perhaps ignition timing changes would show something. I think for power you can use anything that comes out of your local pump and there will be no difference in power. This will be true as well for oil at the same mixture. Zenoahs and their clones have low compression ratios, so higher octane fuel doesn’t show any power difference. Camp fuel is around three times the cost of the most expensive pump gasoline and has no power advantage. This won’t settle any arguments about long term use of fuels or oils. Some oil may significantly reduce wear over others. Some fuels may burn cleaner than others. These tests were not designed to show these differences. When it comes to power, they’re all good. I ran camp fuel for a year (I was convinced that I was doing my engine a favor). I got tired of running to Walmart and went back to gas...much cheaper and same result. I replace the carb diaphram every 3 months anyway....in case there is high ethanol content in the gas. Different stations in my area run different percentages. Man, Ethanol containing fuels are brutal on real boat engines. We were convinced that we would save money by "dilluting" our gas with this less expensive ethanol. Short sited liberalism! Thank you for letting us publish this great article Lohring... it's great info and will put at least some arguments to rest! Otto is some synthetic oil purchased from John Otto designed to be used in gasoline or methanol based fuels. We actually tested a lot more combinations than we reported on in the article. It's surprising how much nitro you can mix into alcohol containing gasoline (alcohol is a mutual solvent) and how little gain there is. I've now stopped worrying about whether we should be testing fuel. The big limitation in our engines is you can't change the compression. We have tested standard nitro fuels in a Quickdraw. Our tests were very brief, but there was a power gain until we damaged the engine. It's just a label to that plotted curved...was most likely using the John Otto oil referred to later in the article. I think the end results of this article are very interesting. There really doesn't seem to be much difference in performance from the various fuels, be it 87 or 92 octane, or even camp fuel. We just have to watch out for the high alcohol fuels and re-tune the carbs accordingly.